Ekiti State Governor, Mr Ayo Fayose, on Friday suspended the Commissioner for Education in the state, Mr Jide Egunjobi, for alleged dereliction of duty. The governor also suspended the Ministry’s Permanent Secretary, Mrs Adekunbi Obaise, for a similar offence. He has taken the public announcement on the suspension of the two officials to the State Broadcasting Services and it was being aired intermittently. Channels Television reliably gathered that the governor had visited the ministry located within the State Secretariat in Ado Ekiti, the state capital and could not find both officials in their respective offices. A source said: “The governor‘s visit was so sudden and unexpected; and when he got there and couldn’t find them, he was so angry and he dropped a hint at that moment that they will be punished”. 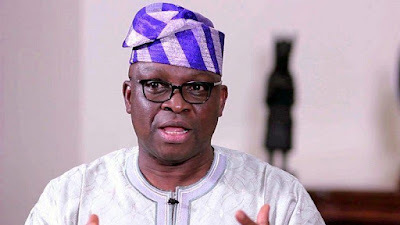 Governor Fayose was said to have immediately contacted his deputy, Professor Kola Olusola, who supervises the ministry and was said to have found it difficult to rationalise the commissioner’s absence on his desk. Also, the State Head of Service, Dr Olugbenga Faseluka, was said to have no valid reasons for the absence of the Permanent Secretary. “When it was apparent through all these investigations that the two officials didn’t take permissions from the expected officials, the governor immediately suspended them,” the source added. Another source in the ministry, however, hinted that the Permanent Secretary had travelled to attend a ceremony which he said prevented her from reporting in the office.